"LASER 1 OPAQUE" (1 Step) Heat Transfer Paper For Dark Garment Printing. 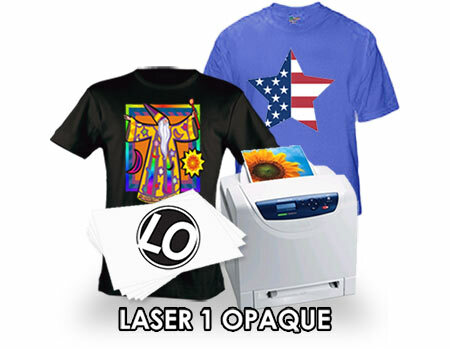 This Heat Transfer Paper is designed for laser printers (with & without fuser oil). For Heat transfer printing of photos and images to dark colored T-shirts, sweatshirts, coasters, handbags, binders, padfolios, paper, leather, magnets, wood veneer, nylon and more. You put this paper directly into your laser printer. Since this paper is made for use in high (and low) heat laser printers some settings may need to be adjusted to achieve greatest results. Choose garments that have a tight weave. This is particularly important when transferring to sweatshirts. SEE SILICONE PARCHMENT PAPER BELOW! Must be applied by Heat Press only!